As stand-alone processors, carrier boards provide an ideal development and deployment platform for demanding signal-processing applications. The carrier board architecture includes an optional built-in gigabit serial optical interface. Up to 12 high-speed duplex optical lanes are available on an MTP connector. With the installation of a serial protocol in the FPGA, this interface enables a high-bandwidth connection between boards mounted in the same chassis or even over extended distances between them. As a FlexorSet™ integrated solution, the analog I/O FMC is factory-installed on the FMC carrier. The required FPGA IP is installed and the board set is delivered ready for immediate use. The delivered FlexorSet is a multichannel, high-speed data converter and is suitable for connection to the HF or IF ports of a communications or radar system. The built-in data capture and playback features and Gen. 3 x8 PCIe interface make them turnkey solutions. Navigator™ Design Suite takes a new approach to solving FPGA IP and control software connectivity. Most modern FPGA-processing applications require development of specialized FPGA IP to run on the hardware, and software to control the FPGA hardware from a host computer. Even when "turnkey" solutions are delivered with complete FPGA IP and software libraries, as developers add their own custom-processing IP, new software needs to be created to control the custom IP functions. Navigator™ FDK (FPGA Design Kit) provides the complete IP for a specific RFSoC data acquisition and processing board. When the design is opened in Vivado’s IP Integrator, the developer can access every component of the Pentek design, replacing or modifying blocks as needed for the application. All blocks use industry standard AXI4 interfaces providing a well-defined format for custom IP to connect to the rest of the design. Each Navigator/RFSoC design includes User Blocks in the data-flow path, ideal for inserting custom processing IP. Navigator™ BSP (Board Support Package) allows software developers to work at a higher level, abstracting many of the details of the hardware through an intuitive API. The API allows developers to focus on the task of creating the application by letting the API, the hardware and IP-control libraries below it to handle many of the board-specific functions. Developers who want full access to the entire BSP library, enjoy complete C-language source code as well as full documentation. While many applications can be satisfied with the board's built-in functions, the FMC carrier boards are an ideal development and deployment platform for custom IP. Supported by GateFlow® FPGA Design Resources, users have access to the complete factory-installed IP at the source level, allowing them to extend or even replace the built in functions. The Pentek ReadyFlow® Board Support Package is available for Windows and Linux operating systems. To accelerate application development, ReadyFlow is provided as a C-callable library, the complete suite of initialization, control and status functions, as well as a rich set of precompiled, ready-to-run-examples. The Pentek GateXpress® PCIe Configuration Manager supports dynamic FPGA reconfiguration through software commands as part of the runtime application. This provides an efficient way to quickly reload the FPGA, which occurs many times during development. For deployed environments, GateXpress enables reloading the FPGA without the need to reset the host system, ideal for applications that require dynamic access to multiple processing IP algorithms. The SPARK® Development Systems were created to save engineers and system integrators the time and expense associated with building and testing a development system. Each SPARK system is delivered with the Pentek board(s) and required software installed and equipped with sufficient cooling and power to ensure optimum performance. As a Certified Member of Xilinx's Alliance Program, Pentek has passed a comprehensive 320-point review of our technical, business, quality, and support processes and have committed engineers who completed the same rigorous training used by Xilinx Field Application Engineers worldwide. Pentek continues to demonstrate years of expertise with Xilinx devices and implementation techniques and consistently delivers high-quality products and services utilizing Xilinx programmable platforms. Analog modules comply with the VITA 57 FMC specification. The interface provides all data, clocking, synchronization, control, and status signals between the module and the FMC carrier. Except for the PCIe Carrier board, all other boards are available in various ruggedized formats up to and including conduction cooling. The VITA's VITA 66.4 standard defines optical backplane interfaces for VPX cards. Pentek's Flexor® Model 5973 3U VPX FMC carrier card is designed to link FMC boards like Pentek's own Flexor FMC line to the backplane through the on-board, Xilinx Virtex-7 FPGA using its VITA 66.4 optical connections. The system was announced at VITA's 2014 Embedded Tech Trends. 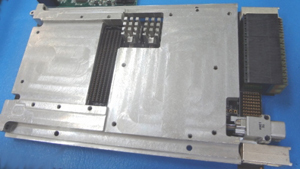 Pentek's Flexor Model 5973 3U VPX FMC carrier board supports an optional VITA 66.4 fiber connection with 12 optical duplex lanes. 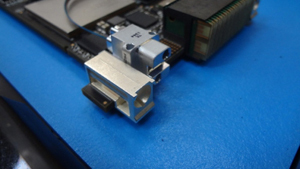 The half size MT optical interconnect is designed to mate with a matching connector on the backplane. The optical transceivers plug into sockets on the Flexor Model 5973 3U VPX FMC carrier board. The cables connect the transceivers to the optical connectors on the rear of the board. This is just another view of the cabling connecting the optical transceivers (left) with the rear connector (right). The P0 and P1 connectors provide VPX backplane support while the optical connector resides in the P2 area. The Flexor® Model 5973 3U VPX FMC carrier board is designed for conduction cooled systems with the addition of the headsink cover shown here. There would be an additional cover after the FMC card was installed. The Flexor® Model 5973 3U VPX FMC carrier board is based around Xilinx's Virtex-7 FPGA. It provides a x8 PCI Express Gen 3 interface via the VPX P1 connector as well as gigabit serial I/O and LVDS support. There is 4 Gbytes of SDRAM and, of course, the optional VITA 66.4 optical interface. 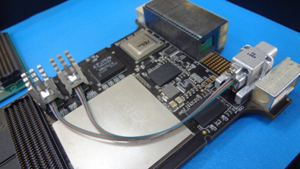 The carrier board supports Pentek's GateXpress for FPGA configuration via PCI Express. New generations of FPGAs provide a level of processing performance and I/O bandwidth that generally surpasses conventional CPU designs. However, the I/O interfaces have become closely tied to the FPGAs, limiting reuse of FPGA designs because boards are designed with a specific type of I/O. Therefore, it has been challenging to design FPGA boards with an I/O suitable for a wide range of customers. A modular design solves this problem, and the VITA 57 standard for an FPGA Mezzanine Card (FMC) was created for this purpose. The VITA 57 standard separates the FPGA from the I/O by defining two separate components: a mezzanine card that provides the I/O, and an FPGA-based carrier card. If a different I/O design is needed, the mezzanine card can be changed, and the FPGA-based carrier can be adapted to the new I/O requirements: the FPGA design can be reconfigured and used with the new I/O module. In this way, the VITA 57 FMC specification solves a major quandary with FPGA-based I/O: how to get optimum I/O bandwidth, and yet be able to change the I/O functionality. Although VITA 57 makes it possible to use FMCs and carriers from different manufacturers, it is not a simple matter. The 38-question compatibility checklist in the VITA 57 specification is an indication of this. If an FMC from one vendor and a carrier from another prove to be compatible based on the checklist and additional investigation, FPGA IP and control software still must be developed. So it is possible to make an FMC and a carrier from different vendors work together, but it takes some time and effort. For this reason, Pentek developed FMC+carrier sets called FlexorSets™ as part of Pentek's Flexor® family of FMC products. All FlexorSets come pre-configured with a suite of built-in functions for data capture, synchronization, time tagging and formatting, all tailored and optimized for the FMC and carrier. This IP enables high-performance capture and delivery of data to provide an ideal signal interface for radar, communications, or general data acquisition applications, eliminating the integration effort typically left for the user when integrating the FMC and carrier. FlexorSet presents system integrators with an ideal development and deployment platform for custom IP. The GateFlow® FPGA Design Resources give users access to the complete factory installed IP at the source level, allowing them to extend or even replace the built-in functions. The Pentek GateXpress® PCIe Configuration Manager supports dynamic FPGA reconfiguration though software commands as part of the runtime application. This provides an efficient way to quickly reload the FPGA, which reduces development time during testing. For deployed environments, GateXpress enables reloading the FPGA without the need to reset the host system, ideal for applications that require dynamic access to multiple processing IP algorithms. The Pentek ReadyFlow® Board Support Package is available for Windows and Linux. The ReadyFlow C-callable library contains a complete suite of initialization, control and status functions, as well as a rich set of precompiled examples, which help accelerate application development. Pentek designs all the FPGA logic to use the Flexor FMC on a FMC carrier. GateFlow® FPGA Design Resources provide an entire FPGA design that you can modify or replace as needed for your specific application. A FlexorSet saves time and work because you do not need to create any FPGA IP. A FlexorSet includes many useful functions built into the FPGA logic. Pentek's GateXpress® PCIe Configuration Manager supports dynamic FPGA reconfiguration though software commands as part of the runtime application. This provides an efficient way to quickly reload the FPGA. Software functions to support all of a Pentek board's built-in functions are already written and ready to use in the ReadyFlow® software that Pentek provides with its products. Pentek's FMC carriers offer an optional VITA 66.4 optical interface. Pentek guarantees the analog and digital performance of Pentek products. We design our carriers and PCBs to deliver the highest possible analog performance. Pentek's FlexorSets are tested, shipped, and supported as an assembled unit from one company (Pentek), with Pentek's quality support on the whole board set. The Flexor® line of FMC carriers and FMC modules combines the high performance of the Virtex-7 with the flexibility of the FMC data converter creating a complete radar and software radio solution. As stand-alone processors, carrier boards provide an ideal development and deployment platform for demanding signal-processing applications.